As I recently clicked through the Twitter feed for the Urs Fischer show, I came across a tweet by Galen Pehrson, an artist/streaker who obviously loved the show. He tweeted: Urs Fischer show best enjoyed naked and jumping, and included a photo of himself streaking naked through the crowd-sourced assortment of fired clay pieces on exhibition. Pehrson, by the way, has executed two recent video commissions for MOCA: one for last year's REBEL exhibition, and another for MOCAtv. OK, that looks like a lot of fun but it got me thinking about a paradox. MOCA has now become a place where you just might see a live naked person but it is very unlikely that you might see a painting of a naked person there, especially one executed with real skill. 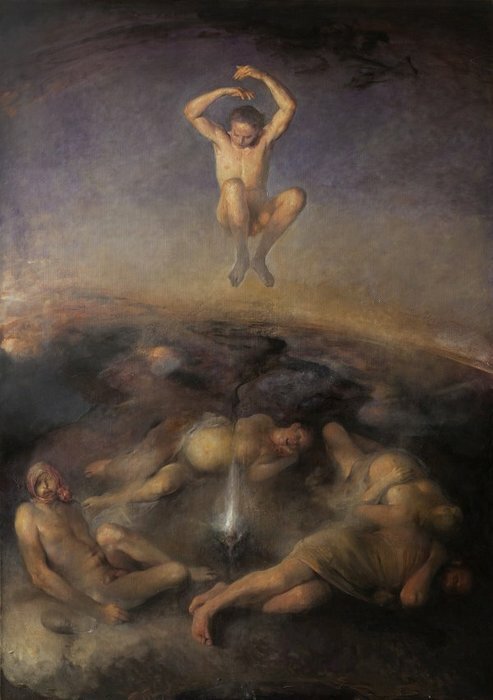 Marina Abramovic's live human centerpieces have been seen there (at MOCA's December 2011 Gala) but Odd Nerdrum's masterful paintings of human figures have not. To reassert its identity as truly progressive institution MOCA's future plans could and should include showing what the Hammer and the soon-to-open Broad Museum won't be showing in the coming years: an all-encompassing range of contemporary representational paintings. Interestingly, and somewhat ironically, one source tells me that Jeffrey Deitch had quietly been working to craft a show of New Figurative Painting prior to the announcement of his departure. If this rumor is true I say good for Deitch and I hope the exhibition comes together. To give this conversation more specificity -- and to help MOCA's theoretical new Head Curator plan some shows -- I am appending an alphabetical list of living, working painters whose work would look splendid at MOCA. I have purposely omitted some artists who are already well-known to Southern Californians: Wayne Thiebaud and David Hockney for example. Because of the difficulty that would have been involved in posting a large number of images I have simply linked each name to the artist's personal website, or a site containing examples of his or her work. I would very much like to thank my Facebook friends for helping me assemble this list. Like Urs Fischer I know that crowd-sourcing is a great way to get things done.